Item # 300826 Stash Points: 1,199 (?) This is the number of points you get in The Zumiez Stash for purchasing this item. Stash points are redeemable for exclusive rewards only available to Zumiez Stash members. To redeem your points check out the rewards catalog on thestash.zumiez.com. Providing their unique streetwear touch to Santa Cruz's signature iconic skate styling, Odd Future and Santa Cruz have joined forces to unveil their new line of accessories, apparel and skateboard hardgoods now available at Zumiez! The White and Pink Crew Socks feature collaborative brand graphics on the upper while the footbed displays signature collaborative logo script. Stylish and plush, these crew length socks offer a wonderful fit and feel for all day comfort. 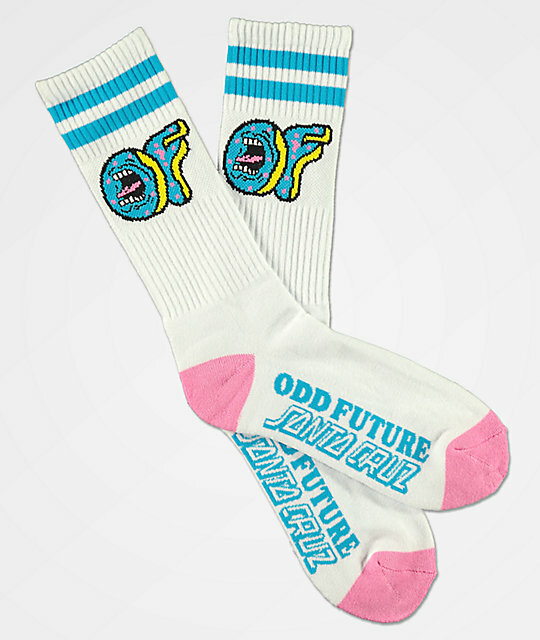 White and Pink Crew Socks from Odd Future x Santa Cruz. Crew length with an elastic ribbed upper cuff. Jacquard knit collaborative brand graphic on upper with collaborative logo script on footbed. 70% cotton, 20% nylon, 10% spandex.